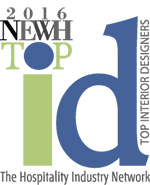 Sims Patrick Studio is proud to be nominated as a top interior design firm by NEWH. This prestigious honor is determined by the chapter boards with consideration of a firm’s quality design work in the hospitality industry along with membership and support the firm has provided the NEWH chapter. Libby Patrick, founding principal and CEO of Sims Patrick Studio, commented, "It is such an honor to once again be recognized by NEWH as a leader in hospitality design. NEWH does such a great job as a networking resource for the hospitality industry, providing scholarships, education, leadership development, recognition of excellence, and business development opportunities."